Hide deals from seller "Purseonality by Phyllis"
Limit 1 per person; may purchase 1 as a gift. Valid toward merchandise. New customers only. By appointment only. Full value of Gift Certificate must be redeemed in 1 transaction. 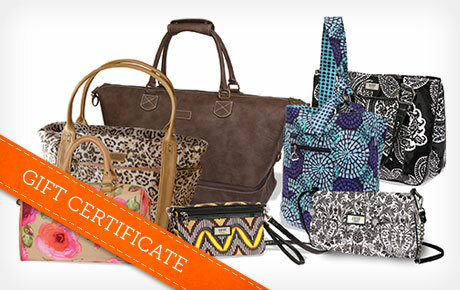 Keep your life beautifully organized with 52% off a $25 Gift Certificate to Purseonality by Phyllis. This independent distributor offers designer bags, accessories and more from Gigi Hill. Phyllis became a stylist for Gigi Hill more than two years ago after she fell in love with their high-quality merchandise and personalized service. Today, she brings their one-of-a-kind collections right to client’s homes. The Gigi Hill collection is filled with bright, eclectic purses, cellphone cases, tote bags and more that are as functional as they are gorgeous. Gigi Hill also offers the Gia and Dani collection, a stylish collection of bags just for teens, and the JM Porter collection for men. Discover a collection that blends fashion and function with this deal. Independent distributor of high-quality designer purses and accessories.